The season of love is upon us. Whether you adore this sweet season or count the minutes to February 15, we’ve got you covered with some decidedly different Valentine’s Day-inspired travel plans. Behold, five ways to take the Hallmark out of the holiday throughout Olympia and beyond. 1. Downtown Getaway: Bring the person you want to grow old with to a live performance of The Wedding Singer, The Musical at Olympia&apos;s downtown Capitol Theater. Sing along to some of the songs from the 80&apos;s Adam Sandler classic and fall in love with that special someone all over again. The musical features a stunning new score, but still pays homage to the original. Just say yes to the most romantic musical in 20 years. Don&apos;t forget to cap it all off with a cocktail at Dillingers Cocktails and Kitchen! Feb. 13th through Feb. 17 Dillingers will feature a different theme each night with an accompanying decidedly different drink that is worth staying out a little bit later than you told the babysitter. 2. Sunset Stroll: Set out for a sunset stroll along the beach at Tolmie State Park then head for a pint at nearby Top Rung Brewing. With 1,800 feet of shoreline and a three-mile trail system, Tolmie is an ideal destination for taking in the early winter sunsets. Choose a clear day, bundle up and settle in for Mother Nature’s light show. Post-sunset, warm up with a pint, free pretzels and a meal at Top Rung Brewing. Pack a picnic, order food to the brewery or check the website for a rotating schedule of food trucks that visit Wednesday through Saturday. Pro tip: check the tide tables and sunset chart to maximize your visit. 3. For the Whole Fam: Have littles in tow? Bring the family out on the town for a group date. Local chefs and restauranteurs welcome pint-sized palates with delicious fare and kid-friendly venues. Bring the babes to the brewery at Fish Tale Brew Pub where parents sip handcrafted ales fresh from the source and everyone enjoys a creative, locally-soured upscale pub menu. Sophisticated fare meets family favorites at locally loved Iron Rabbit, where root beer is brewed on-site, fresh and local. 4. Dinner & and Movie: If you&apos;re the type that prefers something simple like dinner and a movie, fall in love with the food and drink at Uptown Lounge&apos;s three-course, Valentine&apos;s Day Prixe Frixe menu that will knock the socks off of any date and then head next door to Yelm Cinemas to catch a romantic (or not-so-romantic) movie. Enjoy the savory comfort food at Uptown Lounge but you&apos;re really there for the "Love Potions", 5 handcrafted Valentine&apos;s cocktails . If the Prixe Frixe menu isn&apos;t your thing, their classic favorites will still be available on a limited à la carte menu which means there&apos;s something tasty for everyone! 5. 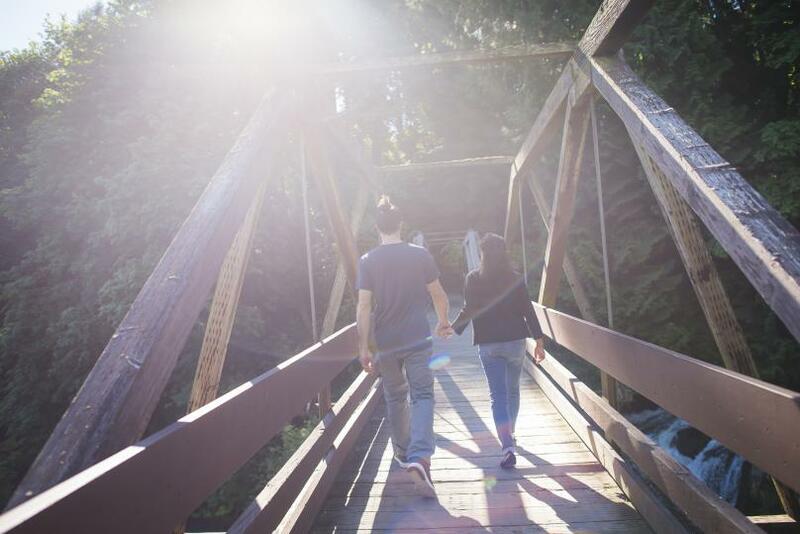 Nature&apos;s Bounty: Add a rustic feel to your Valentine&apos;s Day date by plotting your path throughout the Thurston Bountiful Byway&apos;s scenic, self-guided tour. A handcrafted experience that you will never forget, the Byway offers opportunities to celebrate with wineries, breweries and a distillery! Natural scenery all along the way, it&apos;s easy to enjoy the tour with a walk or by bike. There are plenty of local trails and parks but the real fun is at the local farms, many of which offer tours and visits. How romantic and if you&apos;re looking for a last-minute gift, stop in at a unique local spot or shop to get your special someone something decidedly different!